This guide is intended to provide a comprehensive description of the encounter with Warlord Zon'ozz in Dragon Soul. It is mostly targeted to healers who desire to have a short but detailed overview of what is expected of them during that fight. The Warlord Zon'ozz encounter is rather stressful and challenging from a healing perspective. It is composed of two alternating phases, the first of which will present healers with some simple movement and positioning challenges as well as rather high and unpredictable raid damage, while the second is a heavy raid-damage phase that will require a large amount of sustained healing. 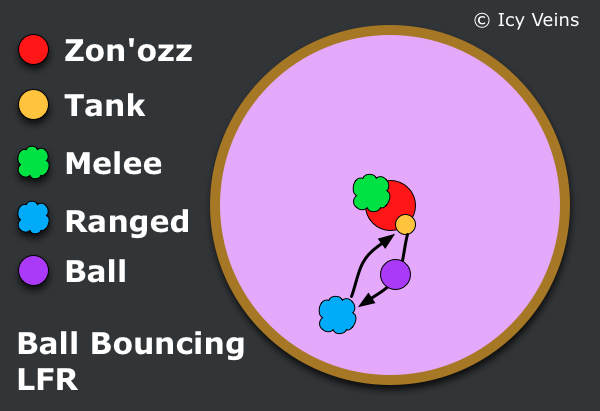 The damage done on Zon'ozz will keep increasing as the fight goes on (each bounce that the Ball makes causes Zon'ozz to take 5% increased damage when the Ball hits him). Therefore, it is important that the Ball be properly handled during the Ping Pong Phase. From a tactical perspective, during this phase healers will stack with the Ranged group and bounce the Ball (Void of the Unmaking) between themselves and the Melee group (or the tank, in LFR difficulty) until the raid leader asks the Black Phase to be triggered (this is something only the melee should worry about). 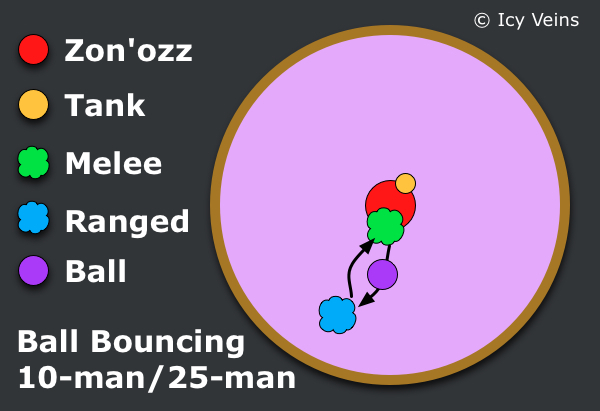 The images below show raid positions for efficiently bouncing the ball in LFR and normal difficulties. Increasing tank damage from melee attacks ( Focused Anger) as well as occasional spikes of damage on the tank ( Psychic Drain). Regular raid damage, caused each time the Ball collides with either the Ranged or the Melee group. A DoT ( Disrupting Shadows) that is applied to a few (3 in 10-man and 7-10 in 25-man and LFR) random players, every 20 seconds, that deals 30,000 Shadow damage every 2 seconds. This debuff also deals 60,000 Shadow damage (and knocks the target back) when dispelled. You should aim to dispel this as quickly as possible, without jeopardizing the life of the raid members (dispel when they are full or almost full health). In LFR difficulty, dispelling the DoT has no side-effects and should be done immediately. During the Black Phase, the raid will take heavy Shadow damage for 30 seconds. Ideally, your raid will stack up close to Zon'ozz. You will be required to put out a high amount of AoE healing to keep the raid alive. This is also the ideal time to use raid cooldowns ( Power Word: Barrier or Devotion Aura) as well as other healing cooldowns. Once the phase is over, the boss will restart the Ping Pong Phase. Note that from the moment Zon'ozz is hit by the Ball to approximately 15 seconds after Black Blood of Go'rath starts, Zon'ozz will not perform melee attacks. There are two differences from Normal mode that are of concern to you, as a healer. Several tentacles spawn during the Black Phase, dealing massive raid damage. Disrupting Shadows can no longer be safely dispelled, unless the players affected by it are far away from any other raid members. As a result, in most cases, the damage from DoT must simply be healed through. During the Black Phase, you will simply have to put out a much higher amount of healing than in Normal mode. Making use of defensive raid cooldowns is a must. At the end of the fight, the healing will be at its most difficult, as your raid will most likely ignore a few tentacles, leaving them alive.